This facility with paint has led some to dismiss Monet paintings , along with Impressionism, as merely visual, naturalistic, and committing the ultimate sin - formlessness. 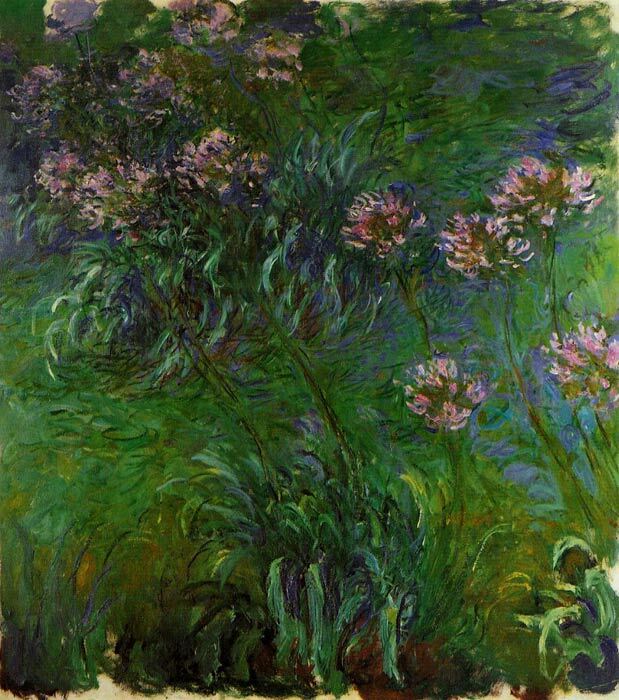 But to those who prize color over form, Monet's paintings is colossal in its nature - just as colossal in its own way as Cezanne. Though Monet began with Impressionism's fleeting moment in time, Monet's work over time became less interested in external reality, and more in the abstract qualities of paint on canvas. This development peaked with his late water lilies series of large paintings, in which color, light and paint were the subjects, anticipating mid-20th century painterly abstraction. SPECIAL NOTE : The painter will make the reproduction as close to the original oil painting as possible. If you want your painting to alter from this likeness, please email us and " Agapanathus , 1914	" will be reproduced according to your special requirements.